The flight from Dulles to Keflavik was about five hours. This is the second time we've taken Iceland Air, and I am still not impressed with their in-flight services. For an international flight, there's no meal given except for drinks. If you're hungry, meal is available for purchase. Since we'd rather spend our money on "proper" food when we landed in Iceland, we spent the duration of our flight watching movies; they did have a good selection of movies and TV shows including "The Descendants," which I'd love to see again. Quite a moving and powerful movie I'd say. When we got to Keflavik, we took the FlyBus to Reykjavik (1800 ISK per person). I slept the entirety of the bus ride, as I sat beside a German tourist who kept nudging me with his elbow because he couldn't stop yapping and taking photos inside the bus. I was too tired and sleepy to protest so I let him be. I think he was just too excited to be in Iceland. I was too, but at that point in time, sleep is more important. After a 45-minute bus ride, we finally arrived at our guesthouse, which was a small house smack in the middle of Reykjavik. The house was cozy and warm; it was more than we needed as we crept to the living room's sofa to sleep some more. Our host, Bedda, was so welcoming and friendly. We slept mostly on our first day in Iceland. We managed to walk around Reykjavik that night, since it doesn't really get dark until 1 AM. I will talk about Reykjavik in a different post but today, I want to show you Skógafoss Waterfall. 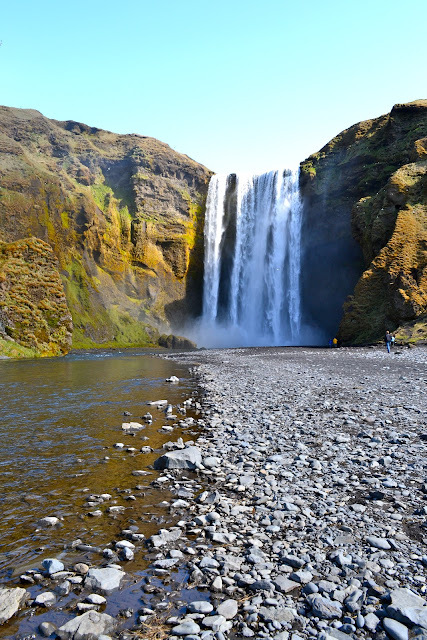 Skógafoss Waterfall is about an hour and a half drive from Reykjavik. This waterfall is 60 meters high and counted among the most beautiful of the country; I think Gulfoss is prettier. There are at least 20 more waterfalls that cascade down the mountain slopes above the Skogafoss and it is easy to walk along the river to see them; there are paths and steps available for hikers in the area as well. My interpretation of Skógafoss Waterfall. A rainbow appeared as we walked around the area. Here's two tourist taking a photo with the rainbow. Trying to find the rainbow's end. At the other side of this river is a sheep farm. It would be awesome to sit there and listen to the powerful voice of nature. 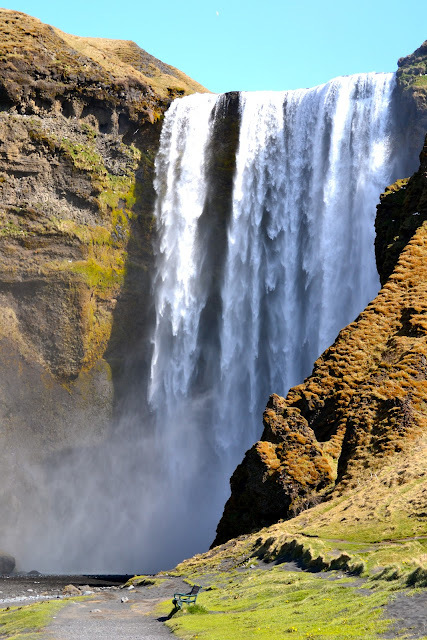 And while the Skógafoss Waterfall roars from a few steps, sheep graze and nap on the green, quiet grass. It's so beautiful. Iceland is one of those places which seem to be so out of reach. I would love to visit because the scenery is spectacular. Loree, I agree. The scenery there is beautiful and emotes indescribable feeling of freedom and happiness. My experience there was fabulous. I'm really curious about Iceland and the neighboring countries. I know almost nothing about them. Hence I cannot wait to see the rest of this travel documentation. BTW, do they speak good English out there? It's not in any of my travel list, but nothing is written in stone so who knows. Yes, they speak good English. They have a thick accent though, but most speak very good English. Icelandic language is so hard to learn though :(. I will be posting more of Iceland. I really enjoyed our stay there. Iceland is just five hours by flight from Maryland/DC/VA. It's very convenient as it's a non-stop flight. Wait until you see the other waterfalls :). Breathtaking!You can almost touch the rainbow! oh wow. i was waiting for you to post these on FB. ang ganda.